Love your card Lucy- that layering has all the wow factor you can wish for! Wowzers, Lucy! LOVE this!!! I know...I say that every time, but you never post an ugly card, so I can't help myself! lol...Great card!!! Beautiful emphasis on the flower! So gorgeous! Love your idea to use 3 different, but coordinating papers for the layers!! This is such a pretty flower! Love the colors and layering. Nice clean card! 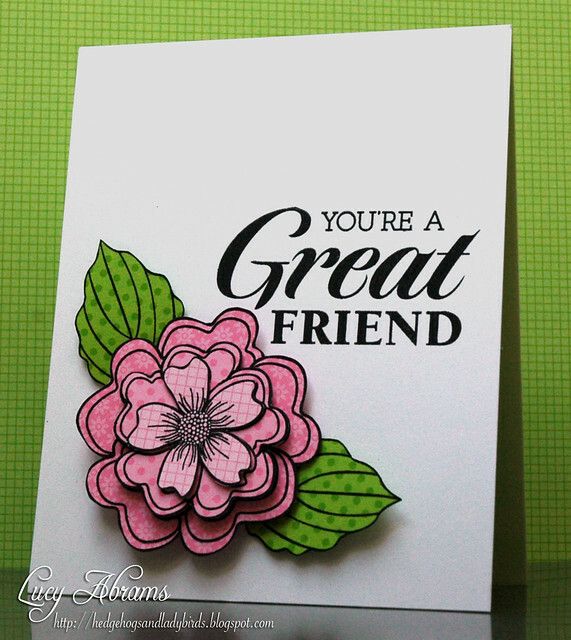 Oh WOW Lucy, that flower is gorgeous, love the dimension, and that sentiment ROCKS!!! Outstanding card!! !